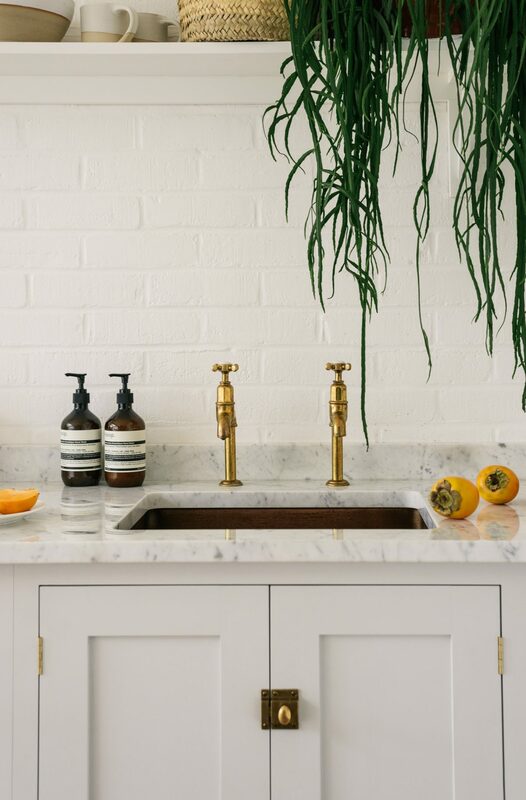 Should I have a real marble worktop in my kitchen? This is probably one of our most-asked questions ever so I thought it deserved its own blog post. We design and make and install lots and lots of kitchens every week, many of them have real marble worktops and many of them have a man-made material such as Silestone for the worktop. Of course there’s pros and there’s cons to both options, but we have to admit that for us, nothing quite compares to the real, natural thing. I hope this blog will help you decide if it’s the one for you too!! A few of the good bits, a few of the not so good bits and lots of photos so you can compare the look of real and man-made surfaces. 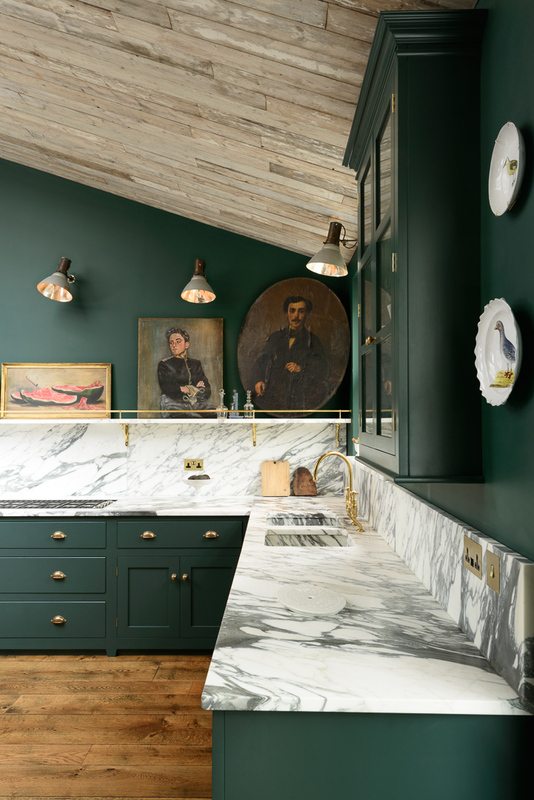 Shiny polished Carrara marble in the very cool Clapham Kitchen, natural materials just felt right in this room. Although a fairly soft stone, marble is a strong, hard-wearing and very tough material that can take a great deal of use. Marble has been used for both decorative and functional purposes for thousands and thousands of years, popular all over the world, in particular the Mediterranean, to build temples and other religious structures, huge government buildings, statues and eventually it made its way into almost every home too… yet these days people still worry it may not be suitable for a worktop or a sink!! Marble became an abundant and surprisingly economic material, not to mention a completely beautiful one too. Oh and if you’re wondering what marble actually is, then here’s a short definition – Marble is a metamorphic rock composed of recrystallised carbonate minerals, most commonly calcite or dolomite. 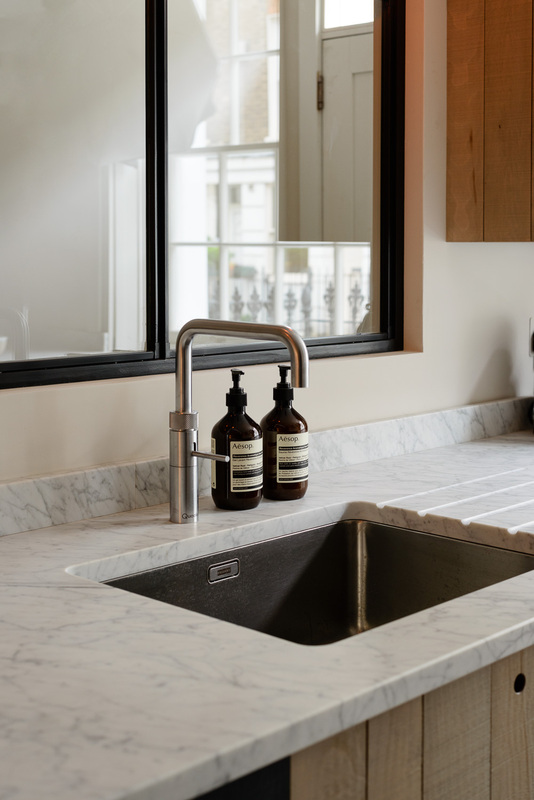 Carrara marble worktops and a deVOL Milano Penthouse marble sink, a dreamy combination. BUT DO EXPECT IT TO CHANGE AND AGE WITH TIME AND USE, IT WON’T STAY PRISTINE FOREVER! It’s true, you will have to live with the little nuances that come with marble, knocks and scratches and etching, you’ll need to allow the surface to really settle in. If you spill a glass of red wine you’ll need to be sure to wipe it up straight away to avoid any lasting damage, you’ll need to be a little more aware of the surface you’re dealing with or just be happy to let it go if you notice a mark or spot. We love things with soul, things that change and age and get better, things that take on character, rather than things that simply get tatty or just go out of fashion. And if the last few thousand years are anything to go by… marble will be cool and beautiful and a good idea forever. 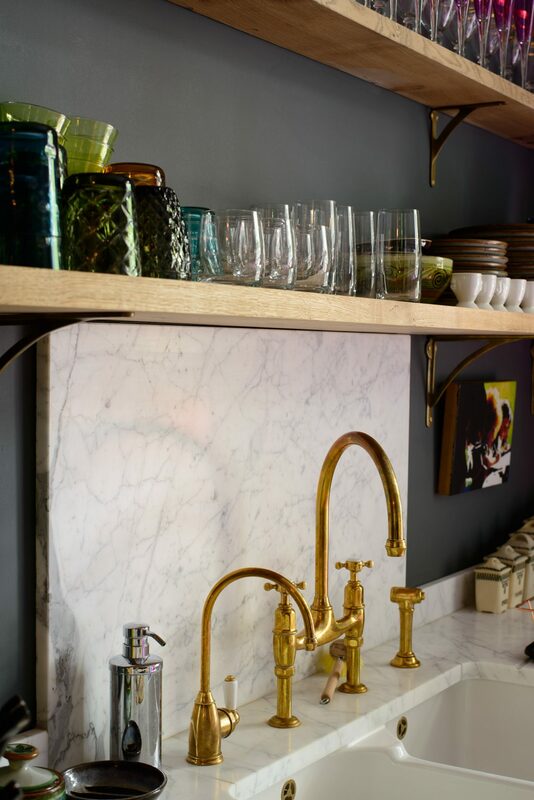 Honed Carrara marble created a practical and very good-looking splashback in the Islington Townhouse Kitchen. 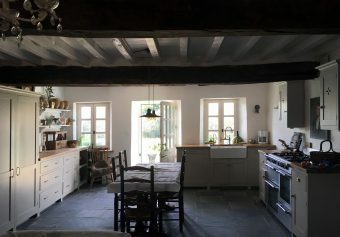 Of course everyone is different, the style of your homes and your requirements, desires and expectations are different and when you’re spending a lot of money on a new kitchen you want to feel like you’re making a sensible and practical decision for you and your future. Some people like everything to be just so, perfect, they like glistening and shiny and easy to care for surfaces that never change and need no extra special care or attention, just spill things on them and wipe them clean. That seems very sensible and logical too. If you’re the type who just can’t bear to see a stain on your new work surface then we’d definitely recommend you explore a few man-made options, companies such as Silestone and Caesarstone are a great place to start. This family chose ‘Lagoon’ Silestone for its uber hard-wearing properties. OK, BUT WHAT ACTUALLY IS A MAN-MADE QUARTZ WORKTOP MADE FROM? 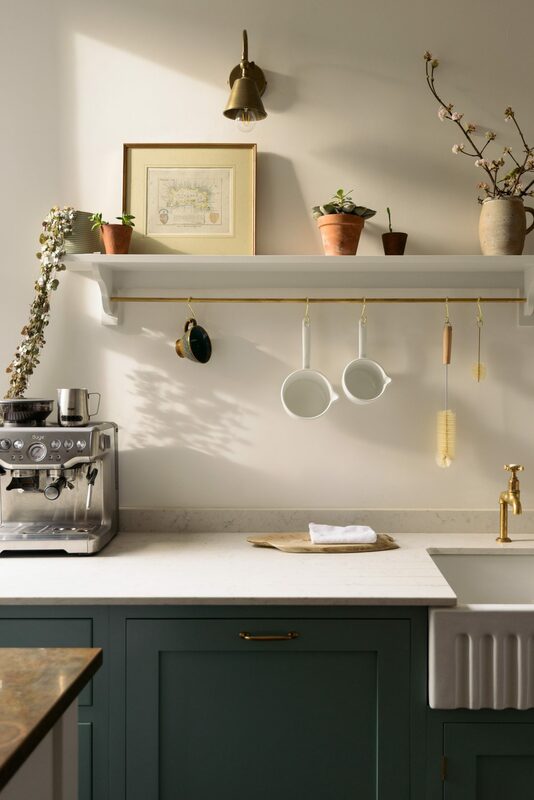 So when we’re talking about man-made stone worktops, we’re talking about the natural material quartz that has added chemicals, resins and pigments to make it into a hard-wearing, non-porous material for your kitchen. There are many different brands who make their own version of a man-made quartz-based worktop, just like the two I mentioned above. 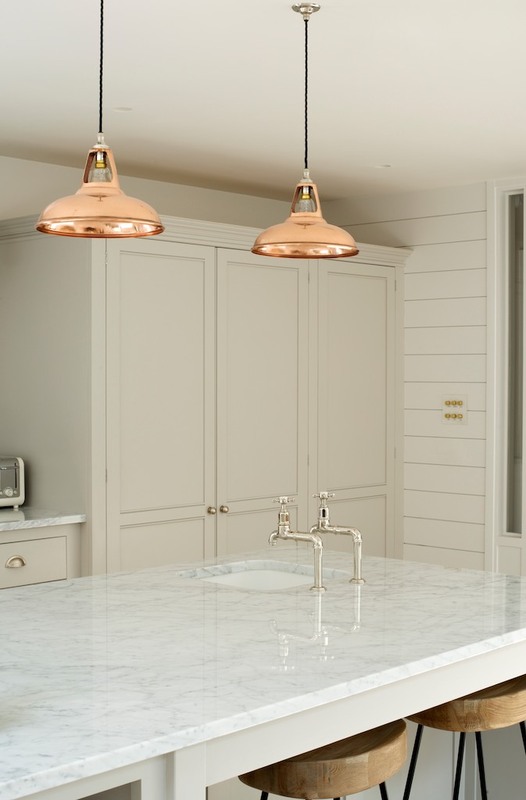 Typically, a man-made quartz worktop will be made up of about 90% natural quartz and the rest will be unnatural products… there is often confusion about whether these are natural surfaces – to put it simply, they’re not. These types of worktops are extremely durable, stain-resistant and easy to care for. We’ve chosen a mix of ‘Lagoon’ and ‘Helix’ Silestone for our Shaker showroom at Cotes Mill, these surfaces look beautiful and it’s nice to able to show our customers a different look to our usual marble or wooden worktops. The Georgian Apartment in Bath features a man-made surface by Caesarstone, it looks pale, sleek and will take a great deal of use. I guess this is a personal thing, what do you prefer aesthetically? 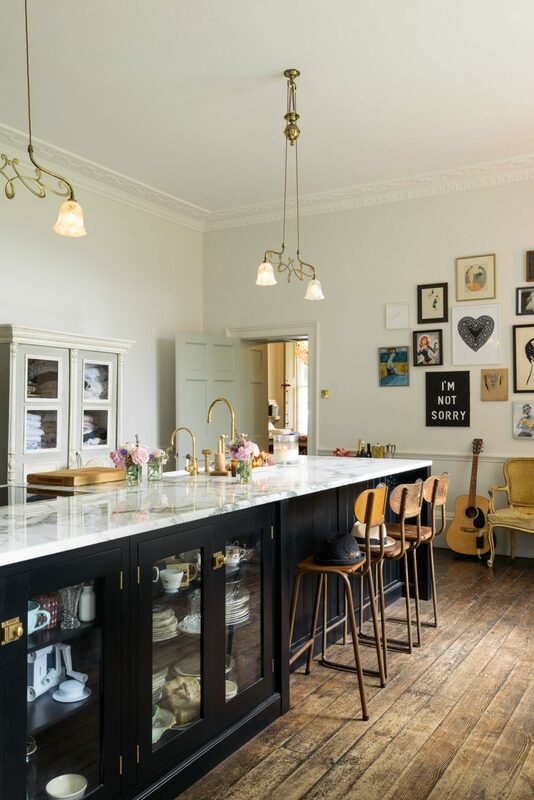 but if I was designing my dream kitchen it would always feature real marble, maybe classic Carrara or my new favourite, Arabescato… either way, there’d be marble and lots of it!! Its smooth finish feels cold and expensive and oh so luxurious and although you can get prettyyy close, I think its beauty is unmatched and impossible to totally replicate. I guess I’m the kind of person who would choose something for its beauty and not just for its function. Oh and if you’re into cooking and baking, a marble top is a must – the cool surface is ideal for rolling doughs and fresh batches of pasta with minimal sticking!! A huge slab of fabulous Arabescato Vaglia marble topped the island in our Frome Kitchen. YES, MAN-MADE SURFACES HAVE COME A LONG WAY… BUT WILL I ACHIEVE AN IDENTICAL LOOK TO REAL MARBLE? Like I said above, no, you’ll never achieve an identical look to the real thing… but you have so many options to get you very close. 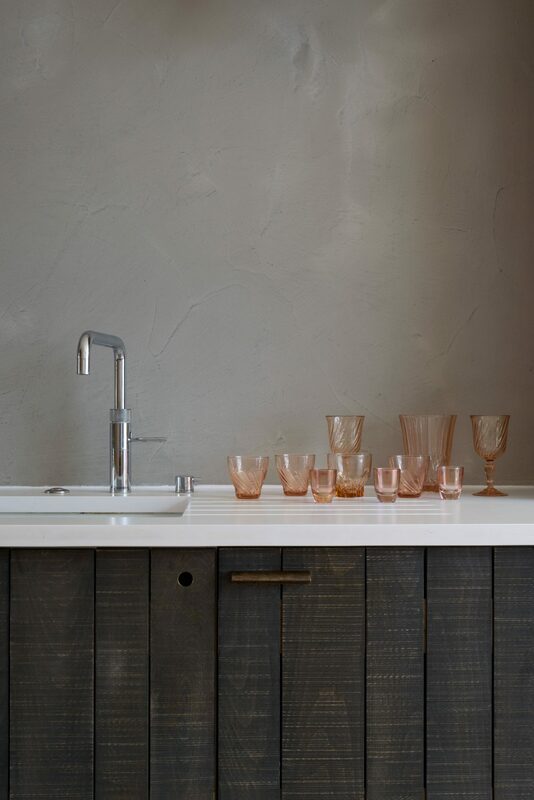 We offer a small selection of Silestone finishes to our customers, with the most popular being ‘Lagoon’. 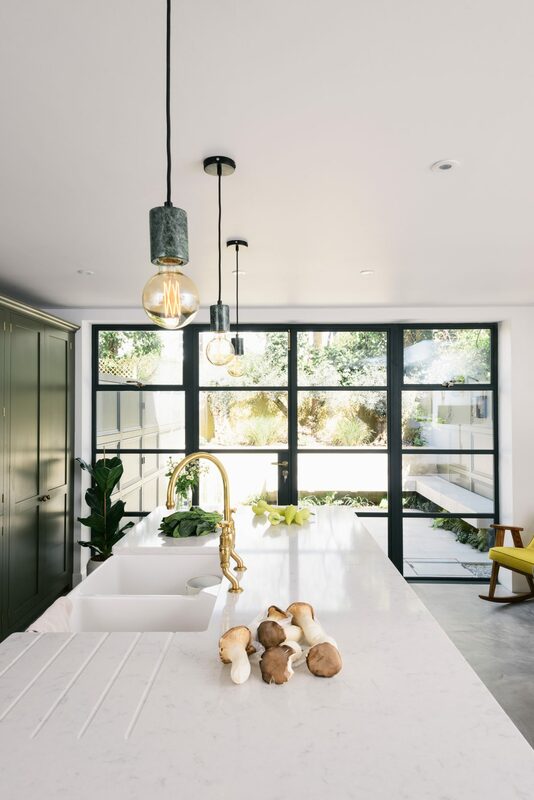 Our Kitchen Designers here at St. John’s Square estimate that about 50% of their customers who are after the simple ‘marble look’ actually go for Carrara marble and the other 50% go for ‘Lagoon’ Silestone. So it’s neck and neck. Now, it’s important to remember that the ‘Lagoon’ finish isn’t necessarily meant to mirror Carrara marble, more just a natural looking, pale stone. The available finishes though, are endless, and there’s many formulated to almost perfectly resemble natural marbles. We have samples in our showrooms but always try to encourage our customers to remember that looking at one small-ish square just doesn’t give you the same effect as seeing the material laid all throughout a kitchen… you can look at a sample and think it just looks nothing like marble but you might be surprised that once laid, it’s much less detectable. 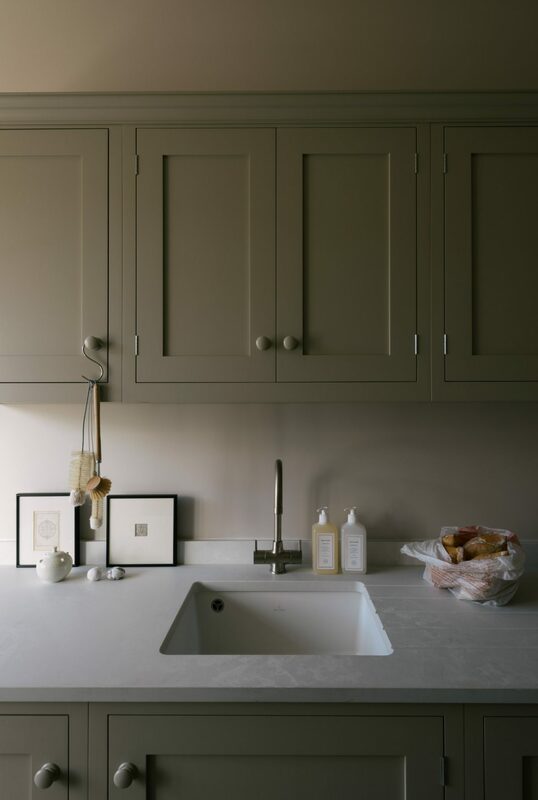 ‘Lagoon’ Silestone was a practical choice for this very lovely deVOL Kitchen in Cardiff. WILL REAL MARBLE COST ME MORE THAN A MAN-MADE STONE SURFACE? This is one that always seems to surprise our customers. More often than not, real Carrara marble will cost you less than a man-made surface like Silestone. Carrara marble is fairly abundant and we have an amazing supplier and the ability to offer really competitive prices. So yes, typically Carrara marble will cost you less than a man-made alternative. Now, if you’re wanting something a little more exotic like the natural San Simone quartzite from Brazil or the amazingly bold Arabescato marble then you’ll be looking at a much higher cost, these stones are rare and much harder to source. We’ve chatted to a few customers in the showroom who have actually chosen to source second hand marble for their homes – I love this idea, yes it might take some searching to find a piece big enough or with the perfect finish, but how cool to have a little piece of history in your home, something that already comes with so many stories, years of use and that perfectly worn-in look. The Peckham Rye used natural Arabescato marble to the max and the result is quite amazing. It’s becoming more important to us all to look after our world and not be wasteful or throwaway. Some worktops are much more sustainable than others but they certainly all have their pros and cons, it’s always sensible to do your research. Think about where you are sourcing your worktops from, if you can get a material locally then that’s a good option, if you can go for a plastic-free material then try your best to do so, if you can upcycle or reuse then it’s worth a thought. There are often debates about the sustainability of marble – it is of course non-renewable and the extraction process uses a lot of energy, and supplies will eventually run out depending on demand. But it is also a natural material, therefore it is recyclable and will also last for a very long time. 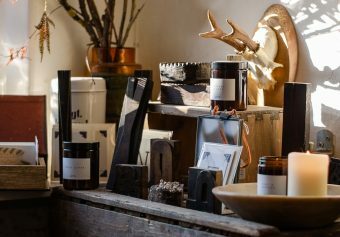 If you are the kind of person who enjoys using natural materials in your home then it’s an option to consider… we always enjoy seeing people choose the best materials to furnish their houses, knowing that they will age well and be enjoyed for many years. When you do up a property, you’re adding style and value to your home, so it really is worth seeking out quality as it will repay you in so many ways in the future. 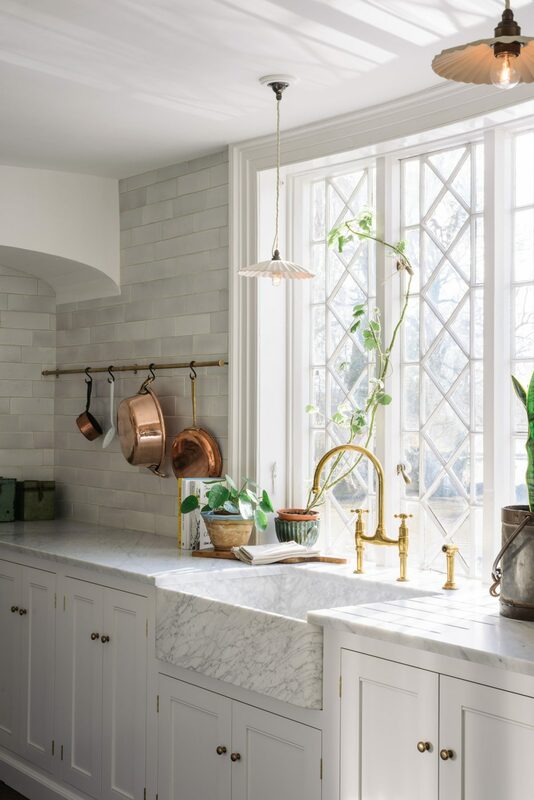 The Bloomsbury Kitchen uses Carrara marble with a smooth, honed finish. I THINK I WANT TO GO FOR MARBLE, SHOULD I HAVE A POLISHED OR A HONED FINISH? I thought this might be a helpful one to throw in at the end just in case you’re in this predicament!! If you do decide to have marble, you will need to choose between a shiny ‘polished’ finish or a much more matt ‘honed’ finish. Similar to most things in this blog, there’s not a simple answer, sorry!!! Firstly, you might have a preference aesthetically – polished is a little more luxe and glamorous, honed is a little more understated. I’ll help you with the benefits of going for polished first… polishing the surface of your marble adds a layer of protection, so for things like red wine spills, the substance is less likely to completely penetrate and stain the surface if it’s polished compared to honed. The Strawberry Hill Kitchen features a polished Carrara marble worktop, notice the lovely reflections on this surface. A honed finish is slightly better at hiding scratches, but these will still be visible no matter the finish you choose. With acidic substances like lemon juice or vinegar, a honed finish will hold up slightly better. If you spill lemon juice on a polished marble it will cause etchings and ultimately take away the shiny effect, leaving a slightly matt patch. Much less shiny and reflective, this Carrara marble has a honed finish. ‘Blanco’ Silestone gives a very contemporary and clean look to our Camberwell Kitchen. 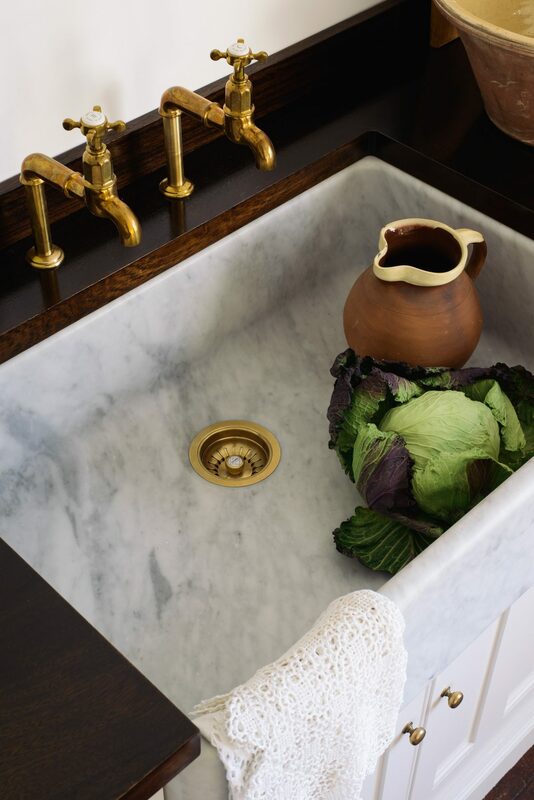 The very handsome Tuscan Farmhouse 800 Single Sink from our marble sink collection. 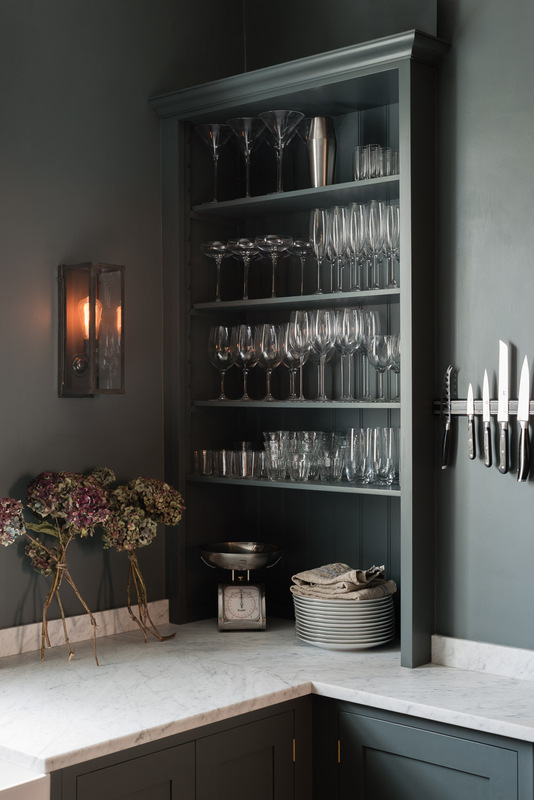 And if you’re in the process of ordering a deVOL Kitchen and are struggling to make a decision on your worktops then just give your designer a little call. They’ll be more than happy to chat through all the options we offer, whether it’s marble, Silestone, wood, granite or copper, as well as how our templating and worktop fitting service works. 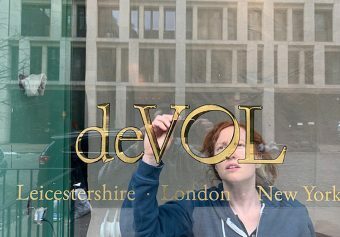 For any general enquiries, as always please call 01509 261000 or email enquiries@devolkitchens.co.uk.